The last Sunday in May is Turkmen Carpet Day in Turkmenistan. This national holiday was established in 1992. Carpets have always been a part of Turkmen everyday life. They symbolized power and wealth of a family. 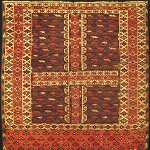 Special technique and ornaments distinguish Turkmen carpets from carpets made by other nations. Carpet manufacturing is closely intertwined with culture and history of Turkmenistan and today carpet weaving is very important for state economy. Traditional carpet patterns are even depicted on the flag and emblem of Turkmenistan. Turkmen Carpet Day became an official holiday in 1992. Traditionally the Turkmen Carpet Museum become the center of celebration. The museum was established in 1933, more than 2,000 exhibits (some of them are extremely rare) are displayed there. Turkmen Carpet Day is aimed to revive, preserve and develop creative traditions of Turkmen carpet weaving. Different activities are organized to promote national art of carpet weaving and search for talented people.